Offering you a complete choice of products which include milk storage and transportation tanker, carbon steel storage tank, chemical tank, air receiver tank and storage and transportation carbon dioxide tank. We, Cryostar Tanks and Vessels Pvt. Ltd leading manufacturer of milk storage tank and transportation tank of milk in wide range of various capacity for use in domestic and commercial purpose. 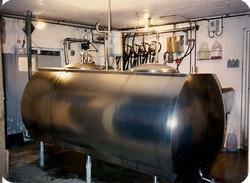 We have over 30 years of rich experience in the design and manufacture of Carbon Steel Storage Tanks. Besides design and manufacture, we have the additional experience of operating carbon dioxide storage tanks and this gives us the leading edge with technical expertise along with practical experience of using the equipment. Our intricate design is the outcome of our experience in operation of these tanks. 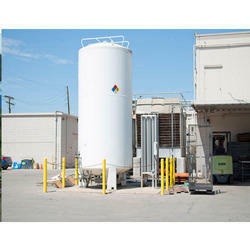 We have over 30 years of rich experience in the design and manufacture of Chemical Tanks. 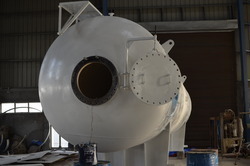 Besides design and manufacture, we have the additional experience of operating Chemical Storage Tanks and this gives us the leading edge with technical expertise along with practical experience of using the equipment. Our intricate design is the outcome of our experience in operation of these tanks. We design and manufacture Compressed Air Tanks. Tanks for compressed air can be built for processes which need air and gas at high pressures. Such tanks can be designed and built as per specific needs of the user. These all tanks are provided with all accessories like valves, safety fittings, instruments etc. The unit comes with all safety features as per norms. We are a leading firm engaged in the design, manufacture, supply of a range of Tanks for Storage and Transportation Carbon Dioxide. All these products are manufactured by our professionals using top-grade raw material so as to ensure their excellent performance. Offered product is highly coveted in the market for its high operational efficiency, quality and robust construction. 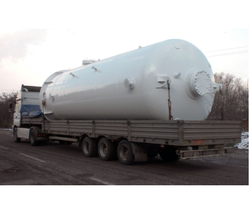 We have manufactured and exported over 200 tanks for the storage and transportation of carbon dioxide all over the world. · Design codes: ASME Section VIII Division 1 & 2 ; EN 13445 and Pressure Equipment Directive 97/23/EC , IS 2825 and any other international codes. Double walled or vacuum insulated vessels for storage as well as transportation of liquid carbon dioxide, duly equipped with liquid CO2 transfer pumps, refrigeration units, safety fittings, piping etc. Within the annular space perlite is filled and the space is evacuated for the purpose of providing high quality insulation. On-site commissioning can be provided.